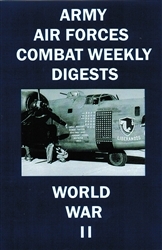 The Army Air Forces Combat Weekly Digests 21-25 WWII DVD contains five films of weekly air combat updates from the European, Pacific, and CBI Theaters. Film #1 - Combat Weekly Digest 21: 13 March 1944 - Flying over the Hump at Jorhat, India. Converted sub mines and Americans landing on New Guinea. The bombing of Rabaul, a major Japanese military base in New Guinea, and Bougainville, which held several Japanese naval bases. Film #2 - Combat Weekly Digest 22: 20 March 1944 - Ledo Road - later named the Stilwell road - was the the main Allied supply road from India to China via Burma. Blue Streak. Bombing of the White Cloud airdrome in Canton China. Bombing of French Indo-China, Bombing of Burma. 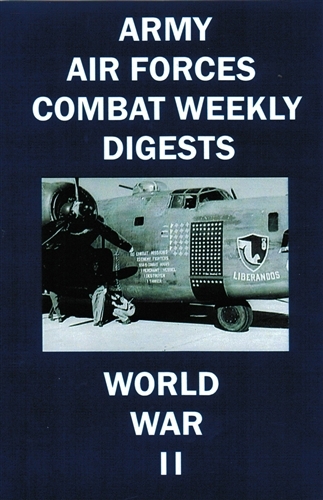 Film #3 - Combat Weekly Digest 23: 27 March 1944 - First American raids on Berlin, Burma front, automatic cameras on B-24s. Truck from salvage. AAF Kiddie car, Bombing of Italy. Film #4 - Combat Weekly Digest 24: 3 April 1944 - Front line hospital in Burma, Search for a crashed Japanese Zero Fighter. New flak helmet, Berlin bombing, the bombing of the Cassino monastery in Italy. Operation Shingle - allied amphibious landing at Anzio, Italy (Battle of Anzio), P-40s at Anzio from the 79th Fighter Group. Film #5 - Combat Weekly Digest 25: 10 April 1944 - Crashed Japanese fighter, New Guinea, Rescue of trapped Fiji scouts. Interrogation of Japanese prisoners, Bougainville, bombing of Rabaul, Harmonization of 50 caliber machine guns, Reclamation and salvage, Bari, Italy, Crew of B-24 after bailing out, Italy. Double header B-26 Marauder operations, England. Total run time for Army Air Forces Combat Weekly Digests 21-25 WWII DVD is 1 hour, 54 minutes in B&W. Format is NTSC DVD and region-free.